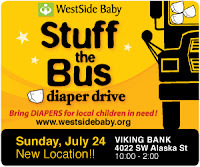 On Sunday July 24th Nana and I took my sons to the Huggies "Stuff the Bus" 2011 Kick off in West Seattle. Huggies Every Little Bottom promotion teams up to have diaper drives in local areas and we were lucky enough to have one in the Seattle area. Sunday the 24th of July in West Seattle we were able to attend the "Stuff the Bus"event and donate diapers for babies and toddlers in need. I had never attended an event for Huggies before and I have to say that it was really well put together. The volunteers were all so enthusiastic and ready to help unload any donation that you brought. The coolest thing to JJ was that he got to climb up in the bus and honk the horn after making our donation! It is reported that 62 Diaper Drives took place all over King County to support "Stuff the Bus" WOW pretty cool. We really enjoyed seeing everyone in action and knowing that the Seattle Area has been so involved in this has really made me proud to be a part of this community. JJ honking the horn of the bus! There is always a need for Diapers for Little Bottoms in need so please join us in donating to Huggies. You can see if there is a diaper drive near you to attend here. You can donate your Enjoy the Rides Reward points to help purchase diapers for the cause. You can also start your own Diaper Drive in your local area.